Not surprisingly, the My Account option leads you to more links for your PayPal and eBay Seller accounts. After you start selling, your Accounts pages become powerful. There’s also a drop-down menu so you can view past or current invoices. You can look up every detail of your account history, as well as make changes to your personal preferences (such as how and when you want to pay fees). Seller Account: Click here to get a complete explanation of your eBay account — charges, credits, and your current balance since your last invoice. View Invoices: Click the drop-down menu to see your most recent invoice and details of the transactions. You can also arrange to download PDF copies of your invoices. 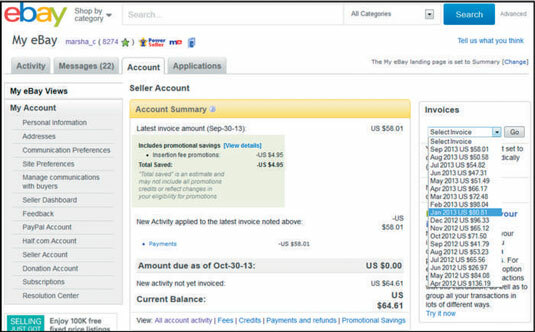 PayPal Account: A quick click here, and you’re taken to the PayPal home page. When you give eBay your credit card information, eBay attempts to authorize your card immediately. Your credit card company’s response, either Declined or Approved, appears on your Seller Account Payment Methods area. Automatic Payment Method: Although you need to post a credit card for ID purposes to sell on eBay, you can pay your eBay bill in one of three ways. They like to deduct it directly from your registered checking account. You can change your method of payment at any time. Credit Card on File: You can place your credit card on file with eBay so that eBay can place your selling charges on your credit card each month. PayPal: You can make single payments directly through your PayPal account. If you have a cash balance in your account, you can have it applied to your eBay bill; if not, you can pay the amount through the credit card you registered on PayPal.